On our way home from work we saw hundreds and hundreds of vultures playing in the outflow of a squall line blowing in from the west. The front crumbled around us, though. We only got a trace of rain. I gave Ondine a week off earlier this month, so Pan is actually a couple miles ahead on their monthly totals. He's great fun to walk. Ondine is back in a harness; we accidentally discovered that she slows down if we loop the leash an extra time under her belly. We only have to do it on streets that make her anxious, like our own. Once we're away from traffic, she's fine and easy. Pan got to meet a black vulture today, but both he and the vulture were more interested in the unlucky opossum it was eating at the time. Ondine got to meet a large long-bearded fellow. She didn't like him at first but was giving him hugs within a couple minutes. Goofball. In a neighborhood yard...these really shouldn't be showing up until March or April. 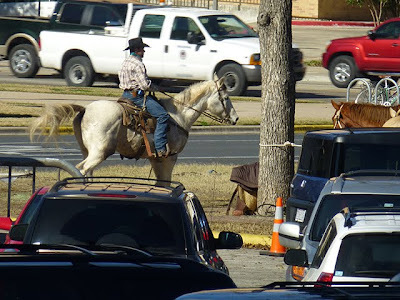 There are a dozen or so horses and riders gathered in the parking lot in front of the Bob Bullock museum today, along with an assortment of large tour buses, trailers and cameras...coming to theaters nationwide, Summer 2014, maybe? ...because truly being here is so much; because everything here apparently needs us, this fleeting world, which in some strange way keeps calling to us. Us, the most fleeting of all. - Rainier Maria Rilke, the Duino Elegies IX (via The Dish).